Weights can be expensive! As you know, I like to build a lot of my own equipment, but I stop at barbell and weights of any kind. I have seen guys make kettlebells and plates out of concrete…it’s just not worth it. I say spend some money, but shop around, and get a good set of weights that will last you a long time. Ok I know CrossFitters love to load the bar with bumper plates, that way when you squat 315 lbs it looks like you are doing something amazing….don’t get me started. Anyway, you don’t need ALL bumper plates for a garage. What is a bumper plate good for?? Overhead lifts and metcons. This way you can drop the weight. You really only need two 45lb. plates as a base and you can add smaller weights that don’t touch the ground for everything else. When squatting or dead lifting…USE IRON!! I recommend getting more than just two 45lb plates, depending on your strength level. Craigslist is full of people who thought they may enjoy a garage gym at one point in their life, but now it is just junk that clutters their garage. The deals you can find on craigslist are insane. People selling $1,000 worth of weights for pennies on the dollar. It is crazy and good for you and I. If you live in a big city or near a big city you will have a ton of good deals. The only thing I have found is that bumper plates are not easily come by these days. I think the type of people who buy bumper plates are relatively serious about working out and are less likely to get rid of them. If you find anyone selling bumper plates below industry average…DON’T HESITATE!! I have found that some people sell their weight sets cheap and almost treat you like a trash haul away service. I made the mistake of not taking a great deal because I didn’t want a lot of this guy’s “other crap”, but he wouldn’t sell any of it individually. If it is a good deal, be a the trash service, and throw other stuff away and keep what you came for. Ok, pay attention here and quit skimming, this is important. First, do you have a Dicks Sporting Goods in your local area? If you do that is awesome. Second, we are looking for deals here. If you have been shopping for weight you already know that for the amount of weight this is a good deal. I bought option 2 last year on sale for $115! That was a great find. This is why I love when the “big boys” get involved in any industry, things get cheap. However, I broke the bar. That’s right, I broke the bar. I had to take it back, and the manager assured me that it was very uncommon. I returned it anyway. But I should have not returned it. I have a good bar now that won’t break, but I really wish I had the weight back. I am about to buy the same deal again and it is only for the plates. The bar will be nice, but I need more plates. This is a great deal for extra weight!! Amazon always has a lot of good deals, but they are not always available. I like to shop around for sets of bumper plates. I have found that to buy individually on Amazon is just like buying just about anywhere else. However, they do have a lot of good deals on sets. Also their bars are pretty affordable. 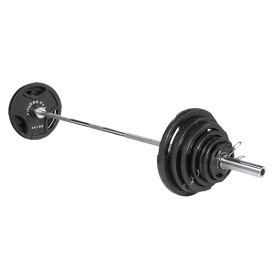 I know you want the amazing eleiko barbell that can hold 10,000 lbs. and is guaranteed to never break. But crossfitters don’t need that. Hell some power lifters don’t even need that. You will be fine with a medium quality bar on Amazon. Again Faster – Seems to have pretty good quality stuff, but personally I have not used any of it or had any experience with them. Maybe someone can help? Add to comments please. The Kettlebell King – I bought the Crossfit Trifector Pack from the kettlebell king. Good quality and very affordable prices. Customer service not good at all. Shipping takes absolutely forever and to get someone on the phone to help you is almost impossible. Took over a month to get my weights. On a good note they eventually got back to me and said sorry it is all on back order and they upgraded my bar for free, which was nice. I think Bert, the owner, is just a little overwhelmed. Rogue Fitness – I have had experience with a lot of their equipment. Customer service TWO THUMBS up! And all of their equipment is of the highest quality. If you are just starting out, I would get my bar here, very high quality.